The countdown to Christmas has officially begun. Now is the time for ice skating, hot cocoa and endless amounts of holiday events throughout the entire month of December. Here are my personal favorites that won’t cost you all of your Christmas budget. Submerge yourself in a winter wonderland like no other. Open nightly at 5:30 p.m. bring the whole family and enjoy the Forest Express Train, the Avalanche Slide, Rudolph’s Raceway, Rod’s Mini Golf, Photos with Santa and of course the Magical Forest. Take a ride on the holiday train to Santa’s Cottage and experience story time with Santa! Rides begin daily at 11 a.m.
Let it snow, let it snow, let it snow! Flakes fall nightly at 7 p.m. transforming Town Square into a winter wonderland. Don’t miss out on stocking decorations with Mrs. Claus and photos with Santa! 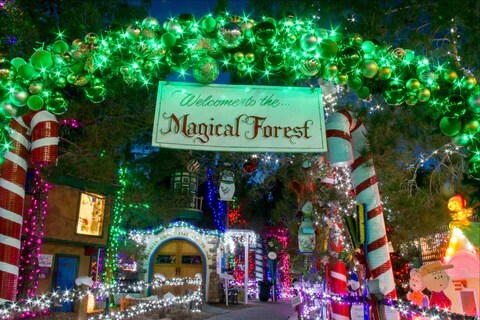 Head to Downtown Summerlin for all your holiday needs! Jingle all the way at the holiday parade December 11 – 24 at 7 p.m. Dash through the snow in Winter Wonderland’s Rock Rink. Don’t miss Eight Nights of Chanukah Fun with daily performances and activities! But before you load the car up, grab your photos with Santa.